This is the last settlement I plan on building for quite some time. From now on, we'll be on the offense. My little peninsular empire is up and running nicely. I now have warrens in my three cities,s and the orcs up on Renegade Hill have built a couple of galleys. We will ride out on the next tide and wash up upon the western isles as a unstoppable force that even King Canute would trouble to turn. The Glen of Killybeg, the first Elohimion settlement we find swiftly falls: despite the benefit of a hilltop defense, the humans find themselves massively outnumbered. Sure, over half my entire army is wiped out in the attack. But my homelands are pretty secure as I doubt anybody else has access to ships yet. And I’m churning out orcish warriors faster than my economy can handle. Meanwhile, some I’ve sent some goblin scouts to explore what lies on the east of the mountain range. So far, there’s just a huge expanse of dark silent forest, punctuated by the odd settlement belonging to my uncivilised cousins. These barbarian orcs may be useful allies in the future. To the east of the impassable mountains. As the war against the Elohim continues, dark omens appear in the night sky. The orchish elders tell me that the Black Candle has moved into prominence and a great prophet, Calwinna of Junil has settled in the city. Surely this is a sign that the humans will soon fall? Legions of orcs continue to emerge from the warrens to sail across the Western Waters. News reaches Braduk the Burning (my capital city) of the existence of other civilisations: the Sidar, Ljosalfar, Sheaim, Bannor, and the Kuriotates. We will deal with these factions later. For the time being, I have my sights set on Cahir Abbey, the capital of the Elohim. 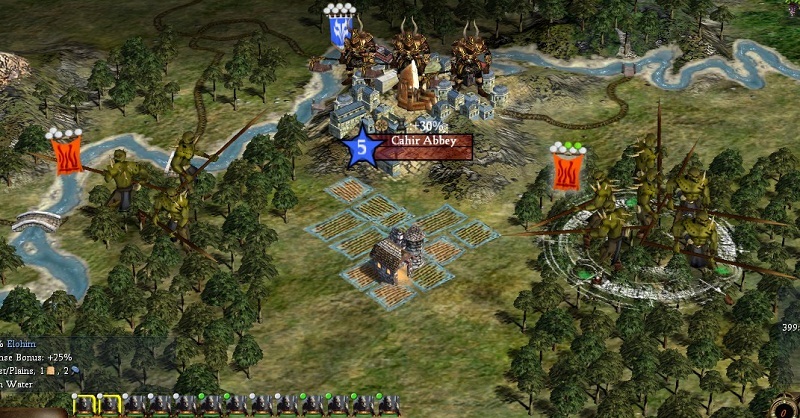 abbey stands atop a fortified hill and is guarded by soldiers of Kilmorph, heavily armoured religious warriors. But they will be of no help to the men and women of Cahir Abbey and again my hoard captures the city after a bloody battle. The downside of building up these hordes is that I keep running out of money, and as such, I don’t always have quite as much control over my army as I would like: when the gold is about to run out, it’s time to charge. Otherwise, my orcish warriors will desert. You can imagine what this has done to the advancement of orcish science! (And having to take a detour to build ships didn’t help either). As such, we’ve only just researched archery and we’re still quite a long way from bronze working. I’m worried that once my neighbours gain a scientific lead on me, I simply won’t be able to field enough warriors to take out their cities. So the plan of action is thus: destroy Inishbofin, the last stronghold of the Elohim and then bed down and hope that the Clan’s elders can come up with some new weapons. The city on the hill: the last remaining stronghold of the Elohim. Sadly, the city is well garrisoned, and I don’t have the luxury of waiting for more orcs to sail across the sea: the clan is flat broke and the horde is hungry. On the plus side, I expect to lose most my army in the initial attack which coupled with the gold we’ll get from looting Inishbofin, should be enough to allow us the luxury of increasing the research rate above 0%! The battle is close, and the bloodiest so far. The first wave of my horde can only take out half the defenders, and although fresh reinforcements arrive, the human defenders will now be experienced. Luckily, my orcs have also picked up a few promotions and the second wave crashes against the walls before the city garrison have a chance to fully recover. The city is torn to the ground and Ethne the White of the Elohim is now more. Poor Ethne. What did she ever do to you? Oh, right, you’re an orc.